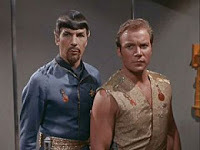 Home / _Television / Nichelle-Nichols / Peter-Weller / William-Shatner / 10 Things You Didn't Know About Star Trek's "Mirror, Mirror"
10 Things You Didn't Know About Star Trek's "Mirror, Mirror"
On October 6, 1967, the original Star Trek series aired the classic episode "Mirror, Mirror." The episode is not only consistently ranked as one of the ten most popular episodes of the original series, but it also established a template for the evil duplicate in pop culture. To celebrate the anniversary, here are 10 facts you probably didn't know about your favorite episode. 1. Screenwriter Jerome Bixby loosely based the episode on his short story "One Way Street" published in the Dec. 1953/Jan. 1954 issue of Amazing Stories. 2. In the original story treatment, Captain Kirk was the only one transported to the mirror universe. He had to fight and return to his home universe alone. He also suffered from an illness caused by the universe rejecting him, like a body rejecting a virus. 3. We got to see Nichelle Nichol's navel in this episode, because a PA took the Standards representative out to lunch during filming. 5. Actress Barbara Luna had strep throat, so they had to postpone shooting her love scenes with Shatner for three weeks. 6. George Takei wears a red security uniform in this episode. That made him the first Trek actor to wear all three uniform colors. He wore blue as an astrophysicist in "Where No Man Has Gone Before," and normally wore gold in every other episode. 7. This episode is the only time in Star Trek history that Scotty addresses Captain Kirk as "Jim." 8. The episode was re-titled for various countries. In Germany, it was titled "A Parallel Universe." In Portugal, it was titled "The Mirror." In Spain, it was titled "Mirror, Little Mirror." 9. Some little girls loved the Captain's woman of the mirror universe so much that they started a campaign to add a "Captain's woman" to the regular Star Trek series. The show responded by telling the girls to ask their parents what a "captain's woman" was. 10. This is Vic Perrin's only on-screen appearance in the original series as Tharn, but his voice returned as Gorn in "Arena," Balok in "The Corbomite Maneuver," and Nomad in "The Changeling."